(DAYTONA BEACH, Fla. - January 12, 2011) - Milka Duno delivered strong results on the first day of ARCA Racing Series presented by Menards testing at Daytona International Speedway with Sheltra Motorsports, the 2010 ARCA Racing Series presented by Menards champion. Duno, piloting the team's No. 63 Dodge, was seventh-quickest of 29 cars in Tuesday's morning session and fifth-quickest of 40 cars in the afternoon session, finishing the day sixth overall. In the morning session, Duno completed five laps, with a best time of 50.06 seconds (179.763 mph). She improved in a 27-lap afternoon session to a best time of 49.37 seconds (182.293 mph). Tuesday was Duno's first time behind the wheel of a stock car since she competed in the ARCA Racing Series season opener at Daytona one year ago. Crew Chief Jon Wolfe and his crew made some adjustments to the car between sessions and worked with Duno to continue getting her comfortable in the car and to try new lines on the track. Patrick Sheltra worked with her throughout the day to help her get the most out of the car. "It was a good practice today and I was very impressed with the team and how professional they were," said Duno. "We are looking for more speed and will work hard over the next two days to get faster. It was great to get Patrick's input, and it was a big help. He's the 2010 champion, and he knows what to do." "Work to Do" for Kimmel: Nine-time ARCA Racing Series presented by Menards champion Frank Kimmel knows where he needs to be to have success at Daytona International Speedway, and admitted that he and the No. 44 Ansell/Menards Ford are not there yet. Kimmel, whose car was the first on track to open ARCA's three-day testing period at the historic 2.5-mile superspeedway, completed six laps in the morning test session and 18 in the afternoon. His best effort for the day came in 50.596 seconds (177.88 mph), placing him 34th of 40 drivers and well below his own expectations. "Well, we wanted to go out and make sure the thing runs real fast. Unfortunately, it's not running real fast right now. We've got some work to do. This is the car we tore up here last year in the race. We qualified 13th, and we expect to be there or in the top 10 by the time we're done. We have some work to do right now," Kimmel said. Kimmel ranked 22nd of 28 drivers in the morning session, which lasted two hours and 30 minutes, and 34th of 40 in the four-hour afternoon session. Kimmel has made 19 starts at Daytona but remains without a win. 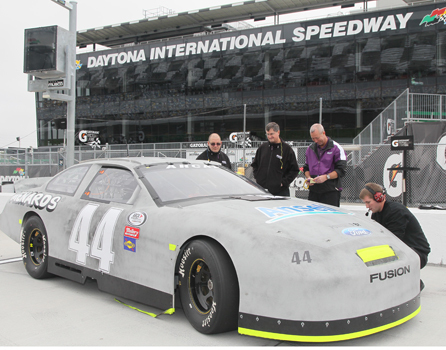 Open ARCA Racing Series testing at Daytona International Speedway continues today and Thursday, with single-car runs in the mornings and drafting periods in the afternoons. ARCARacing.com will carry live timing and scoring coverage for each of the four remaining sessions. "I don't even know that I'll go out to draft. We still have to find out. I'm sure the car will drive great in the draft; everyone's car will drive great in the draft because the track's so good. I'm not too concerned about that. We just have to make it run faster," Kimmel said.